Constructing a filing system that works for you isn’t about the folder color or style, the label size or shape, or how you arrange the tabs. Although those things are important and add aesthetically pleasing details, constructing a filing system that works for you is really about following the flow of your thoughts! Today, we’re tackling our To File pile and learning how to construct a filing system that works for you! How did you do earlier this week with creating your Action Files? Are they helping you to more effectively manage your to-do’s? Creating and using Action Files for my business completely transformed my productivity, number of forgotten tasks, and my customer service! If you’re just joining us, welcome! It’s never too late to jump into Organize Your Files Week! Start here, then follow the series’ links at the bottom of each post. 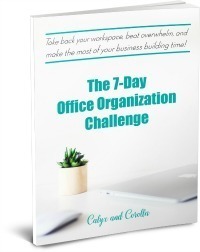 Take the challenges one at a time until you can kiss paper clutter bye-bye! Last week we rounded up and corralled all of our loose papers and paper piles and sorted them into four general categories: To Do, Read, To File, and Trash/Recycle/Shred (read that post HERE). Today, we’re sorting our To File stack and creating file categories that are completely unique to YOU and your business! 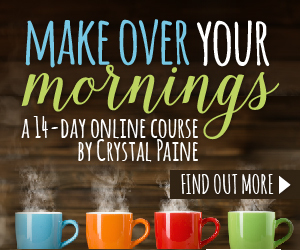 Let’s get started and construct a filing system that works for you! As we did last week in our first step to conquer home office paper clutter, we need to find a space to work. Sorting your To File stack could take a few days to a week (or more), depending on the time you have available and the height of your To File pile. So, find a place where you can work undisturbed for the length of this project. Make sure it’s comfortable! You probably have all of these items or comparable options on hand, so round them up and let’s start sorting! This step in the process is where you truly make this filing system yours! Start by setting your timer for 15 minutes. This is an ideal time block, because most people can find 15 minutes each day to sort their To File pile, and it’s enough time to feel you’ve make progress, but not so much time that you risk burning out and abandoning the project. Start your timer and grab the first piece of paper on your To File pile. What’s the first file name or file category that comes to mind when you see that item? Write it in the top right hand corner of the paper. Also write it on a sticky note and start a pile for that file name. Take the next piece of paper and do the same thing: What’s the first file name or file category that pops into your head when you look at the item? Label it in the upper right hand corner, create another sticky note and pile, if necessary, and move on. When I sorted my To File pile, the first item I grabbed was a Mileage Tracker from January 2018. The file name/category that immediately popped into my head was “Taxes,” because that’s why I track my mileage. You might have thought of “Vehicle” or “Auto” or “Toyota.” The actual name doesn’t matter as long as the file name makes sense to you! The second item I grabbed was a page of notes from a conference call with a client (hmmm, I was looking for those last week! *hand to forehead*). The first file name I thought of was “Client: [Client’s Name].” I don’t know why I thought of it in that pattern, but that wasn’t the point. So, I just wrote it down in the top right hand corner of my item. The next item I picked up was a blank calendar. I wrote “Planning” in the upper right hand corner, because that’s what I primarily use blank calendars for. Again, the trick here is to go with the file name or category that first comes to your mind. This is the vital step that will make this filing system all you! Continue to label your items and sort them into their respective piles until your timer goes off. Then stop and take a break. Repeat the process, if you have time, or pick it up tomorrow. If you get stuck on an item, put it on the bottom of the pile. You will likely have more clarity when you see it the next time. Try to complete at least one round of sorting/naming each day until your To File stack is organized into unique file name/file categories plucked directly from the flow of your thoughts! Once you’ve sorted your entire To File stack, go back through your piles and make sure you don’t have any duplicates. Are there any files you can combine? Did you find any categories that made you think, “Huh, I wonder what’s in this pile?” That’s a sign that you need to rethink it. It’s either too broad, or it doesn’t work for you. This is a really personal part of this process! I may be perfectly comfortable with 35 files, while that might make you break out into a cold sweat. Really tune into your preferences and honor them. That’s the only way you’ll be able to construct a filing system that works for you! And that’s how to construct a filing system that works for you. It’s the process of basic paper sorting with a little magic thrown in. Follow the flow of your thoughts and file/categorize items accordingly, and you’ll have a filing system that’s completely functional and unique to YOU and your business! Tomorrow we’re (finally) getting into the fun part where all of this time-intensive, hard work pays off…. We’ll be setting up our files and file drawer or file box! I’ll see you then! This post is part of the Organize Your Files Week series! I’d love to hear how you’re doing with Organize Your Files Week, and if you’re finding these posts helpful. Just share your thought in the comments below! Thanks for joining me for Organize Your Files Week! Here’s to getting our home offices organized and free of paper clutter!